The name MAYA comes from Maia, the youngest goddess daughter of the God Atlas. If you associate Maya’s father’s name with a large, franchised moving company, then think of the daughter as building an Atlanta moving company that emphasizes hard work to build a solid hometown reputation. It’s in our name. Finally, Maya is also used as a pet form of “Amalia” meaning “industrious” or “hardworking.” We think this characterizes Maya Van Lines. Every day in our office, Phoebe, our Boston terrier, embodies the qualities that have made Maya Van Lines the Atlanta mover of choice for local, long distance and interstate moves. Phoebe greets everyone she meets with her equivalent of a big, wide smile. She does everything she can to please all who come in contact with her – both on a regular basis or just to get one thing done. She always appreciates every kindness shown to her. Phoebe won’t give you and on-site estimate. Nor will she pack your goods, load your truck or make sure everything arrives and is unloaded safely. But Phoebe is with us every step of the way to remind us of what need to do for your stress-free moving experience. We stand committed to quality, integrity and goodwill. 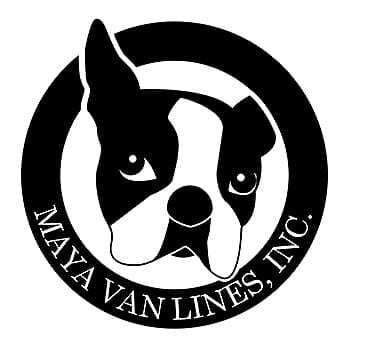 At Maya Van Lines, Inc. customer care and satisfaction is our primary goal for every Atlanta-centered local, long distance and interstate moving job. We plan and coordinate your move to your needs and pledge to deliver your goods efficiently at a very affordable price. To keep our pledge, we carefully wrap all your furniture in professional-grade, quilted moving blankets free of charge. We offer expert crating and packing for valuables and breakables, such as antiques, pianos, and fine art. Our credentials, certifications and ratings are important to us. We are licensed and insured for your peace of mind. We are proud members of the American Moving & Storage Association (AMSA) and Georgia Movers Association. We are a certified "PROMOVER." We are rated A+ by the Better Business Bureau. At Maya Van Lines, Inc. there are no middlemen, agents or brokers to raise your cost and stand between us. Unlike many other companies, your move with Maya Van Lines begins the moment you call for your free estimate. As our valued customer you can always call on us to assist you with any questions regarding your move, or a future move. This is how we earned our reputation for dependability and customer satisfaction. Click here to schedule your free, onsite estimate or contact us today for answers to your questions.